We arrived late last night at our hotel and once we had worked out that the little round key actually worked the lights in the room, we settled in quickly and had a cup of coffee before turning in. The Hotel Europa is much like the rest of the area, perfectly okay in its own right but located in a desolate, shabby part of town. Whilst Liz woke up and did some work stuff, Jo took advantage of a bit of a lie in and didn’t get up until 8am local time (7am UK and 6am pre BST!). We had a lovely breakfast to fortify us for the day before heading off to see how Nimmie had fared in the boatyard. We made the mistake of leaving around 9am so hit rush hour in di Stabia. This means that people walk across the road without looking, cars turn in front of you without indicating, scooters come from all directions with at least three people on them and, if you’re lucky, the child has a helmet on, and cars stop to chat to their friends oblivious to the ensuing mayhem behind them. The weather has been very benign with temperatures in the low 20s so we were in t shirts and shorts all day whilst the locals were in woolly hats and puffa jackets! Entertainment indeed! 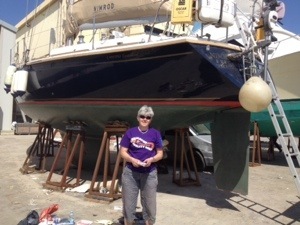 We made it to the boatyard unscathed to find Nimmie once again restored to her former glory. 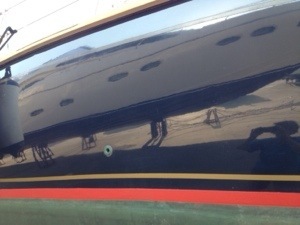 Her hull polished to a deep navy colour and the teak decks looking glorious. They had truly done a wonderful job. We set about completing out own job list which included touching up the coppercoat, repainting the boot strap (a strip of antifoul between the waterline and the hull), greasing the propellers, repairing small bits of the gel coat and replacing the anodes. The men in the boatyard had obviously not seen many women doing their own maintenance as quite a few of them just happened to wander past – several times! We managed to complete all our jobs and get back to the hotel by 6pm. We were, by this time, filthy so both had showers before enjoying a drink on our balcony. 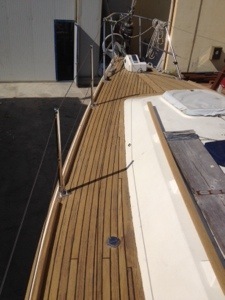 Pictures below of Nimmie all shiny, her teak decks, Liz and a view from the boatyard. 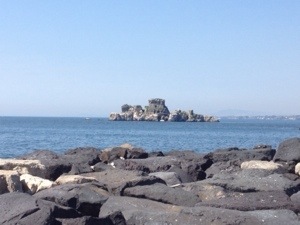 As someone once said, blue water cruising is about mending your boat in exotic locations!